The $9 bln jeans maker reported a healthy profit in its first results since going public last month, giving the stock a fresh boost. It now trades 35 pct above its initial offering price. Levi’s may not be flashy, but the company delivers the goods better than the likes of Lyft. 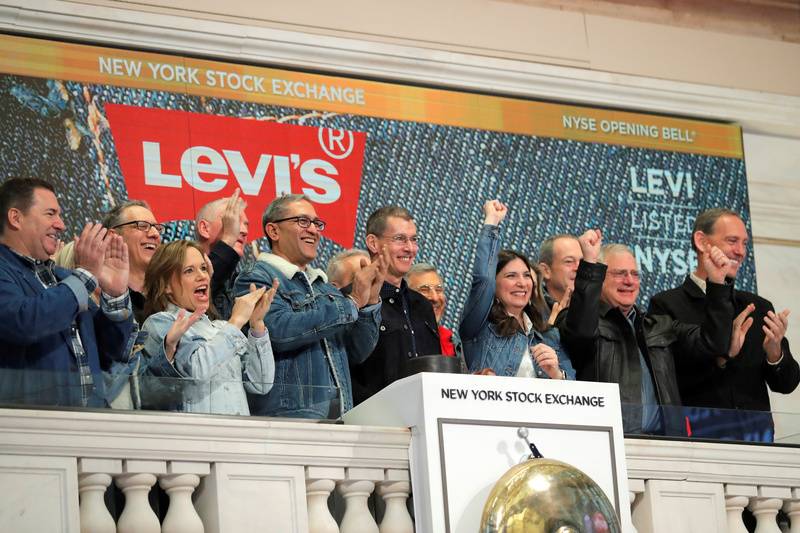 Levi Strauss & Co. CEO Chip Bergh rings the opening bell on New York Stock Exchange (NYSE) during the company's IPO in New York, U.S., March 21, 2019. Levi Strauss on April 9 reported net profit attributable to the company of $147 million in the three months ended Feb. 24, or 37 cents a share, compared with a loss of $19 million in the same period a year earlier. Sales rose 7 percent to $1.4 billion. The company’s shares were up more than 5 percent at $23.01 in afternoon trading on April 10, some 35 percent above the price of its initial public offering.